With 600 million users, Instagram’s growth is showing no signs of slowing down anytime soon. It’s become a prime place for brands to show off their personalities and promote their products to the world. With the introduction of Instagram Live, Instagram Stories, and a plethora of new features, the visual media platform continues to find ways to remain near the top of the social media ladder. This means you should probably start thinking about making Instagram a big part of your social media marketing strategy if it isn’t already. Because the platform is constantly changing, it can be tough to keep up. What are the best ways to market on Instagram? What do people like best? How many darn hashtags should I use? Worry not - I’ve compiled 20 examples of the best recent Instagram posts and crafted some awesome ideas that you can put to use in your Instagram marketing today. This giveaway campaign from Suja Juice is awesome because it’s themed around the 12 days of Christmas, making it relevant and engaging. I love that each day the giveaway prize is something slightly different, helping Suja show off their different products. The link in their bio (which they refer to in the caption) is a Like2b.uy link - this is a great way to use a monetization platform to link to content. 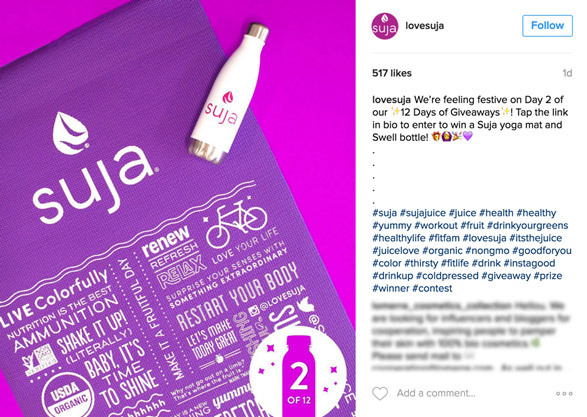 Finally, Suja makes great use of multiple hashtags to reach as many people as possible with their contest. Disney posted this photo to promote the release of their film, Rogue One: A Star Wars Story on December 16th. First, let’s look at the photo itself - it features the stars of the film, including Felicity Jones and Mads Mikkelsen; the sheer fame of the people in the photo is sure to get people interested. Next, the setting is great - there are stormtroopers and other in-costume characters in the background, and the photo is taken in what looks to be a set piece from the movie. 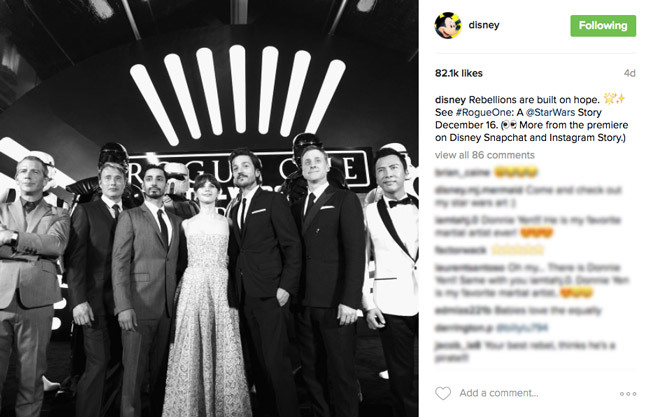 I like that Disney tags the @StarWars account, and uses the hashtag #RogueOne - this increases the chances that Star Wars fans who might not follow the Disney account will see the post on their Explore feed. Lastly, they direct viewers to their Snapchat and Instagram Story, helping to increase their follow on their other social platforms, too. There’s a lot of hype surrounding the arrival of everyone’s favorite neighborhood webslinger to the Marvel Cinematic Universe. Marvel created a short video (a trailer trailer?) to promote the trailer’s upcoming release on Jimmy Kimmel Live. First of all, I love that it’s a video, and that the video itself is unique. It clearly states when the trailer will come out, and when the movie’s release date is. The post features a hashtag for the movie and tags @jimmykimmellive to promote the partnership between the two companies. Using videos to preview upcoming products is a great way to highlight things that a picture might not be able to capture properly. Make sure you add text to the video to let people know when they can expect it and where they can get it. This is a great post because it’s a nice preview of a piece of content that Tesla is hosting on their website. The video itself is just a short clip from the full piece of content - it gives away just enough for the viewer to understand the premise of the content and be “hooked in”. I like that they use a unifying hashtag, #TeslaStories, to link all of their posts like this together and to encourage fans to share their own stories as well. Finally, it’s a great strategy to use Instagram to drive traffic to your own blog or other content platform. Using video to promote content is a strategy you can employ to convey a little more information than a photo might be able to. Make sure to include text in your video with a link to your content - especially because many people don’t listen to the videos they watch on their feeds. Nike does a ton of things right here. Where to begin? The video is short, simple, and engaging. It features a clear shot of the product, cute drawings, and engaging text: “are we running today?” And, oh yeah - it features Kevin Hart, one of the most popular comedians around. What I love most is that the text is inviting and mysterious - viewers want the answer to the question Nike poses in the caption, so they’re likely to visit the page Nike links to. The page itself is a landing page for the Apple Watch Nike+, which features more information about the product. It’s a very cohesive and well-put together campaign. If you want to push social traffic to a landing page, make sure your copy is succinct and inviting. Ask a question or pose a scenario that viewers can answer by visiting your page, and make sure the page matches the theme of your Instagram post. This post from Amazon is a simple success. Though it’s a repost, regramming content from fans and followers shows them you’re listening and actively engaging with the content you’re tagged in. I like that they have a hashtag, #PrimePet, for Amazon-related media featuring pets. 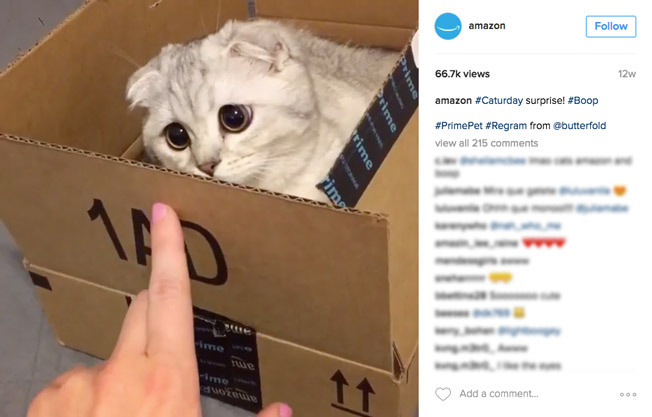 Amazon also leverages hashtags like #caturday and #boop to engage viewers who are interested in kittens. Best of all, the post is just a branding play - besides the Amazon logo on the box (but who’s looking at the box anyways), this is just a post that helps show off Amazon’s playful brand personality. Make sure not all of your posts are about your products - use social platforms like Instagram to engage your consumers in ways you wouldn’t normally be able to. Social media is one of the best places to build your brand. 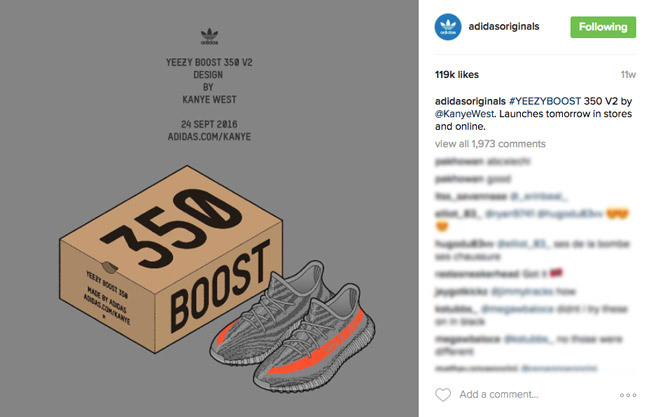 Adidas shows off their product launch know-how in this post promoting a new model of the Kanye West-designed Yeezy Boost 350 V2. The image is creative, featuring vivid virtual renditions of the shoe (and its box!). More importantly, the image also features the launch date and the link people should visit to buy the shoe. Follow these practices when promoting a new product of yours on Facebook - post photos in the days leading up to it that link to a page featuring information about the product: where it can be found, how much it will cost, and product details. Sharing important information like this on your social platforms makes it more likely to reach more people, ensuring your product launch will be a success. 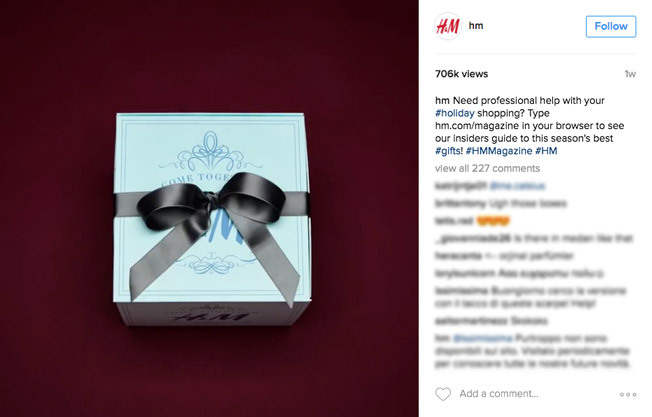 H&M takes advantage of the frantic holiday season by reaching out to gift shoppers with this post. The video is a simple stop-motion clip that highlights H&M branding and the concept of gift-giving. The real value of this post lies in the caption. H&M includes a CTA linking viewers to a high-value piece of content: a holiday gift guide to the “season’s best gifts”. By making the link simple to remember (hm.com/magazine), H&M maximizes the chances that people will visit the link, even if Instagram doesn’t support links in captions. When using Instagram to drive traffic to your content, make sure you clearly communicate its value and make it easily accessible. Louis Vuitton’s 2016 Christmas campaign is a wonderful example of smart, seasonal content. 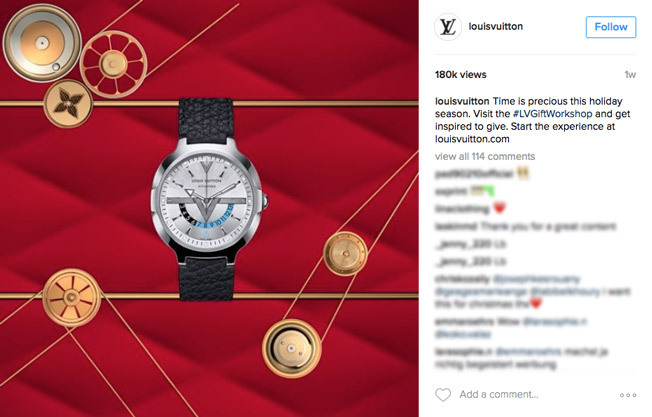 By framing these posts as “holiday gift ideas” from the #LVGiftWorkshop, Louis Vuitton circumvents needing to avoid being overly promotional. During the holiday season, people are on the lookout for good gift ideas; Louis Vuitton takes the opportunity to introduce its wide range of products to its fans and followers. I like that the contest is clearly themed - using red and gold conveys the holiday motif and lets viewers on LV’s profile see that these posts are all connected, increasing the chance that they’ll click through a few of them. When planning social media marketing for your products, keep in mind the big shopping times of the year like Christmas and Black Friday to push products on your Instagram profile. Consider creating coupons for these times of year to maximize sales. This is a great post from Vogue. Firstly, it highlights an influencer, Adriana Lima, and a big event, the 16th Victoria’s Secret Fashion Show. Though the video itself is pretty cool and I love that it’s a behind-the-scenes look at how the Victoria’s Secret models spend their time when they’re not walking the runway. Vogue tags a location, and they include a CTA to click the link in their bio to see the full piece of content. This helps to drive their social traffic to another location where viewers can experience the full piece of content. The link in their bio links to their Likeshop page, which means Vogue can send their viewers to relevant pages without needing to change their bio link often. Behind-the-scenes photos or videos are great ideas for content - they provide your viewers with a special look into how your business operates behind closed doors. This type of content is exciting for customers, who often only get to see your “polished” marketing materials. Finally, a contest! Starbucks celebrates their iconic red cups and the holiday season in this post by encouraging fans to share their photos of their red cups to win a $500 grand prize. Photo contests are an awesome way to generate excitement among your followers, while collecting user-generated content that you can share in future social posts or use for other marketing initiatives. 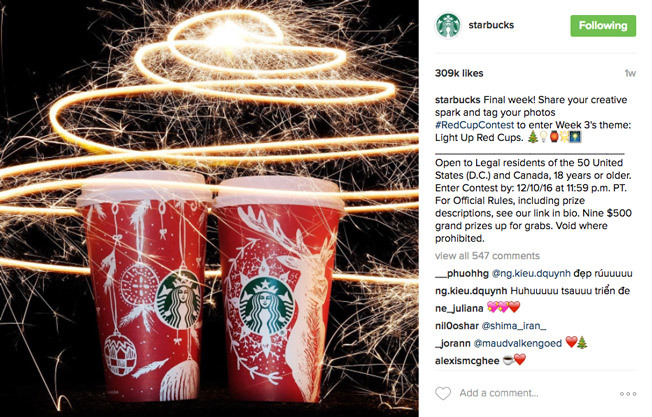 I like that Starbucks chose a theme for their contest (“Light Up Red Cups”), and that they have contest eligibility and prize information clear in the photo’s caption. Finally, Starbucks does a great job in this campaign of highlighting notable entries on their Instagram Story as the contest goes on. If you’re looking to boost engagement, increase your reach and draw in new followers, a contest is the way to go. Use an app like Wishpond (or do it yourself!) and run a sweepstakes or photo contest. Encourage followers to share your contest on social with friends in exchange for extra entries to help it spread. 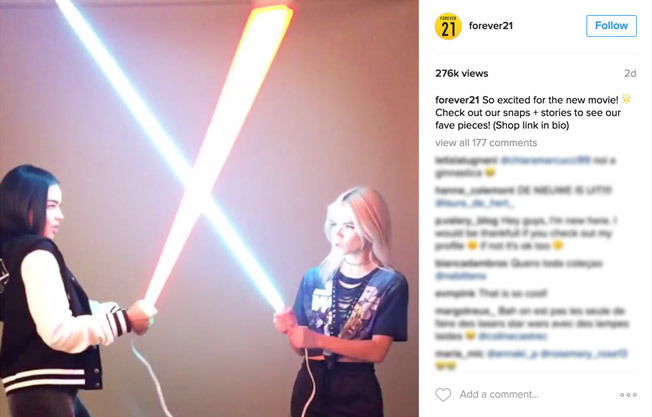 Forever 21 does a great job of capitalizing on the popularity of the new Star Wars movie by posting a Star Wars-related Boomerang post. Besides being topical, this post is great because it has a CTA directing viewers to a link in their bio where people can find their Star Wars-inspired clothing, as featured in the video. Leverage different types of media, such as Boomerang videos, to catch followers’ attention. Keep your eyes out for trending news - whether it’s celebrity gossip, big movie releases, or world news. Post photos or videos on Instagram with your own brand’s take on current events, through things like parodies or references (but try to stay away from politics). This is one of my favorite Instagram posts for the 2016 holiday season. 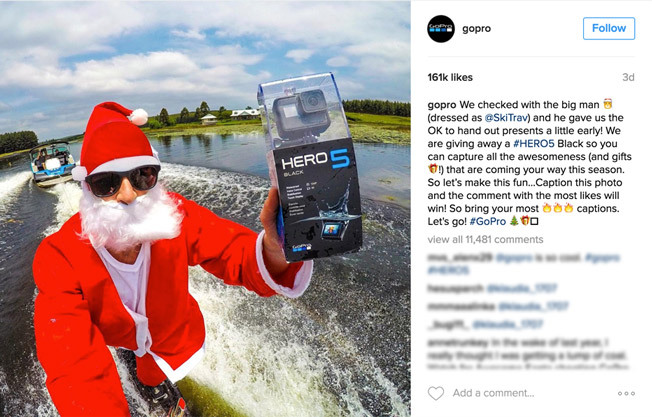 I love that GoPro partnered with an influencer who’s popular with their target market (in this case Travis Fisher, a water skier) and made it holiday-themed by dressing him up as Santa. In this post, GoPro runs a caption contest - a unique, engaging, and easy-to-enter contest type for Instagram users. The prize is attractive (it’s a GoPro) and the contest is engaging because the winner is the comment that gets the highest number of likes (Instagram recently implemented likes on comments). This is a genius move from GoPro, as it means entrants will be likely to share the post on their social channels so their friends will vote. Run different types of contests so you can keep your promotion strategy fresh and exciting. Run thematic contests that encourage entrants to be creative - and incentivize them to share the contest with their friends. This isn’t a campaign to promote a product, but it’s still a great post from BMW. 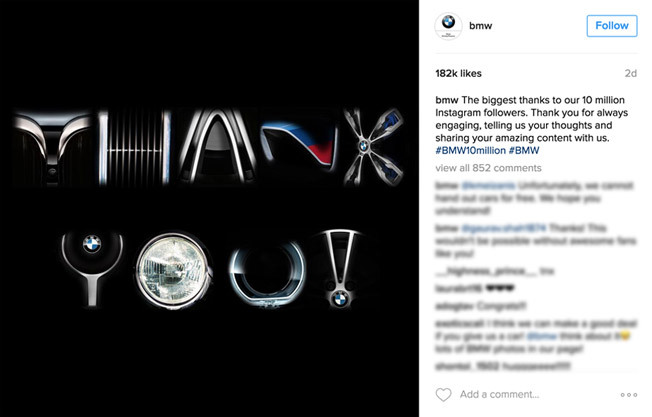 In this set of posts, BMW thanks their fans for helping them reach ten million followers on Instagram. The caption in their “thank you” photo is sincere and the photo itself is creative and unique. Thank your followers - your social media presence wouldn’t be the same without them. Though BMW as a car company probably can’t do this, think about giving out a small discount or coupon when you reach follower milestones, as a way to give back to your social communities. This is a great partnered post with an influencer. It’s seasonal - it highlights a “cute and cozy” winter look. I love that Topshop uses Like2b.uy, a monetization platform that makes it simple for the brand’s fans and followers to find and purchase products from its e-commerce shop. The influencer is popular - she has over 86 thousand followers on Instagram. It’s also great that she’s posted a similar photo from the same shoot on her profile, tagging Topshop and linking to their Like2b.uy URL. 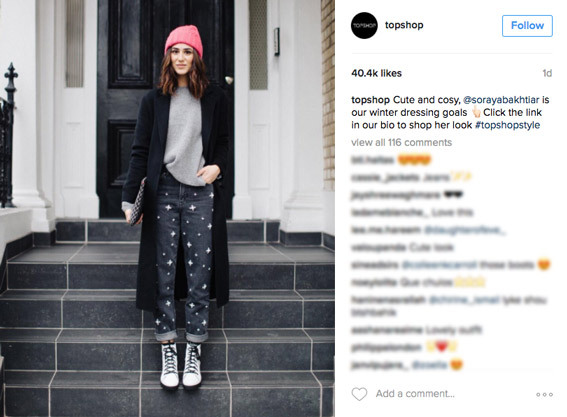 Topshop follows all of the partnered post best practices here, and it’s a great success. This marketing campaign is purely for branding purposes - it helps YouTube reinforce its position as market leader and the home of some of the internet’s most viral content. 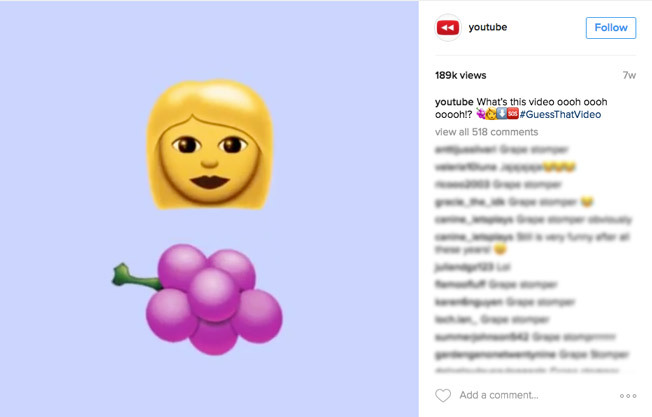 It also succeeded in getting thousands of Instagram users to guess which video each post was referencing, making it astoundingly engaging. Asking your followers questions is a great way to get them involved with your brand, as it shows them you care about what they have to say. If you want to incentivize engagement, consider offering a prize for the best answer or the answer with the most likes. 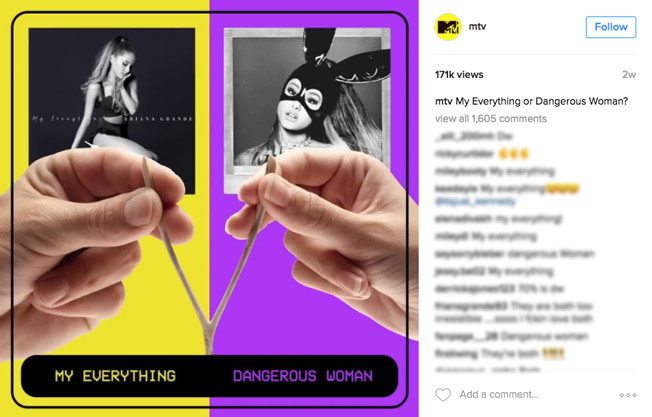 MTV capitalizes on the popularity of artists like Ariana Grande and Drake as well as the Thanksgiving holiday with this Instagram marketing campaign. 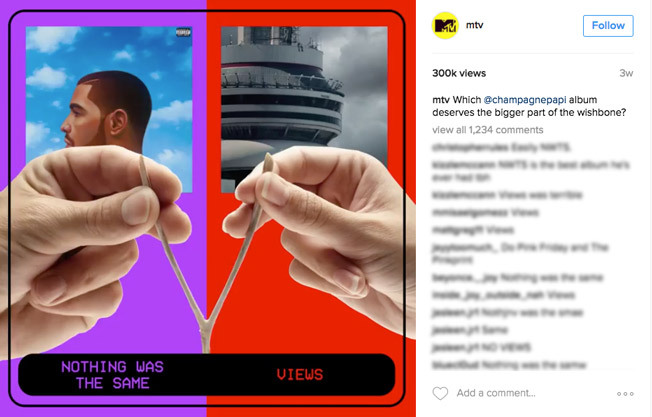 Each post features a video showing two hands pulling a wishbone (a Thanksgiving tradition); the video caption asks followers to vote for the album they think is better. Again, this campaign is engaging as it gets people commenting and creates discussion in MTV’s comments. MTV leverages the popularity of others to help boost their brand’s reach on social platforms. You can try something similar - for example, let fans vote on their favorite color of your newest product, and then add a discount for the winning color. A strategy like this helps to drive both interest and sales - that’s a win-win. As a both a geek and a sneakerhead, I love this campaign. Vans and Nintendo came together to create a line of Vans sneakers featuring Nintendo characters and products. 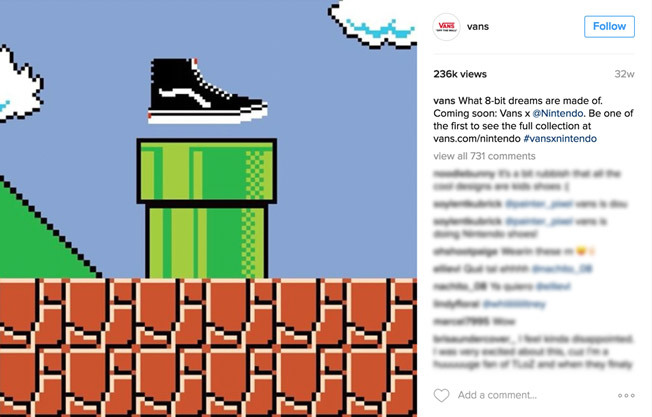 This post, a video featuring a Mario landscape and an 8-bit Vans shoes, perfectly captures the spirit of the collaboration. It’s a product-centric post that doesn’t feel overly promotional, because it’s a creative and unique piece of media. I love that both accounts posted the video and tagged each other, and that the video caption includes an (easy-to-remember) link to the product pages, as well as a hashtag for this specific collaboration. When you launch a new product, consider being creative and going beyond simple product photos. Think of interesting ways to highlight a new product - maybe a teaser, an artist rendition, or something else. This helps your posts stay away from feeling overly promotional, while still helping you share them with your followers. In advance of the launch of the (ultimately disappointing) video game No Man’s Sky, PlayStation posted this extremely creative video. It imagines what a familiar interface (in this case, the iPhone weather app) would look like on one of the planets of No Man’s Sky. This is an awesome way to build hype for a product launch. Because it’s so unique, this campaign drew a lot of humorous comments from engaged followers interested in buying the game. It effectively highlighted the game’s art style and the premise of the gameplay itself in a simple post. Think of creative ways to tip something familiar to your viewers on its head to highlight your brand or product. Doing something like this helps to pull viewers’ attention from their feeds and encourages them to comment and share the photo or video with their friends. Looks like everyone’s hopping on the Star Wars train! This is a perfect example of a company using trending topics to their advantage in social media marketing. 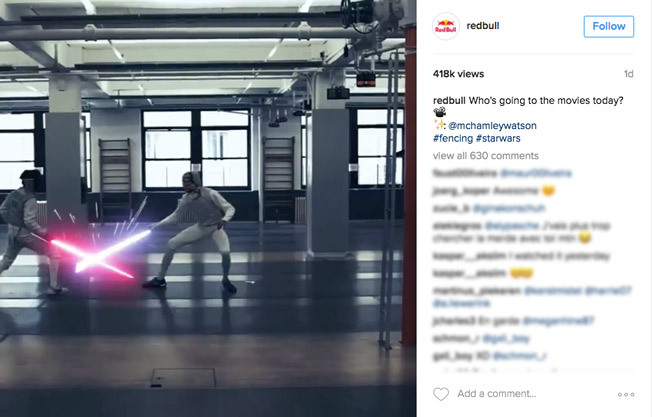 Red Bull takes something interesting to the general public (Star Wars) and something from their own brand (sports - in this case, fencing) and puts them together to create a visual spectacle. There’s no indication that this is the result of a marketing partnership between the two brands, but it wouldn’t surprise me. The comments are full of people tagging their friends, because the media in the post is exciting and relevant to their interests. It doesn’t do anything to promote Red Bull’s products, but you can bet the increased engagement is going to lead to strengthened brand recall. Again, capitalize on current events to reach new segments and engage your current followers. These types of posts are very shareable - use this to your advantage by adding a link to an additional related piece of content or a relevant product. And we’re done! 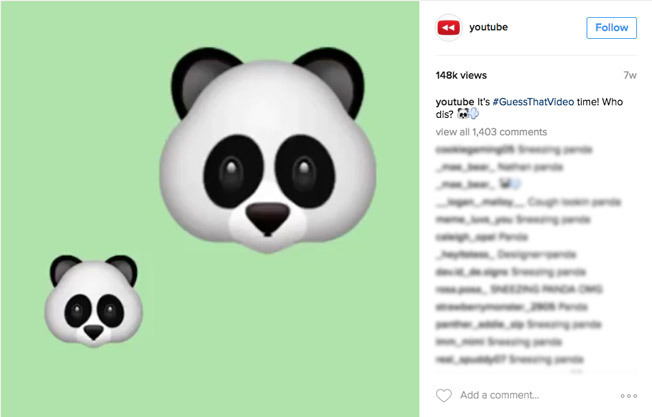 There’s 20 of the best Instagram campaigns I’ve seen. They all employ targeted, precise strategies with clear goals in mind, which is what makes them successful. Whether it’s through influencer marketing, unique and captivating video, or by leveraging current events, each of these campaigns is an excellent example of the potential of Instagram marketing. 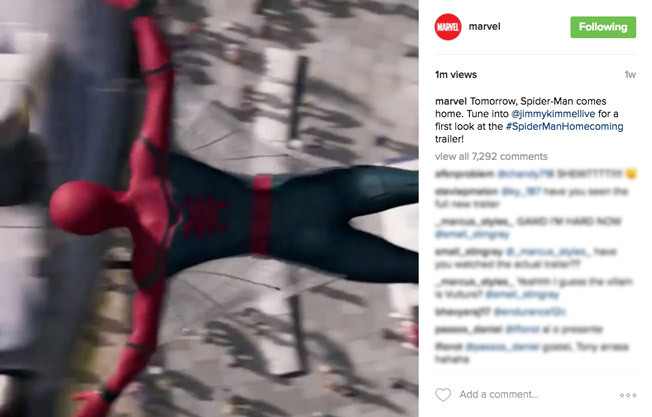 Are there any other awesome Instagram marketing examples or strategies you’ve seen? Share them with me in the comments below!